Congrats on the VegNews job! =) These look super tasty. You know, I got super sad this year when I learned that some Girl Scout cookies are actually vegan, but that the baking company that creates the accidentally vegan ones is not the company that Memphis Girl Scouts uses. They seriously have two different recipes for GS cookies depending on where you live in the country, and NONE of the ones sold here are vegan. You have just fixed that problem. Thanks Annie! Congrats on the VegNews task and mention. I actually came to this post via the VegNews online article. Love it! I wish actual Girl Scout cookies were vegan, too. You guys did an awesome job with the "Girl Scout Cookie" - and I pinned it! My husband grew up in Edison, NJ and we go back quite a bit - it's a charming little place, no? Woah. those are my favorite girl scout cookies too. I have long lamented the loss of GS cookies in my life. Even before I was vegan, I quit eating them because (as a former girl scout) I know what a total crock it is to call that a "fundraiser". 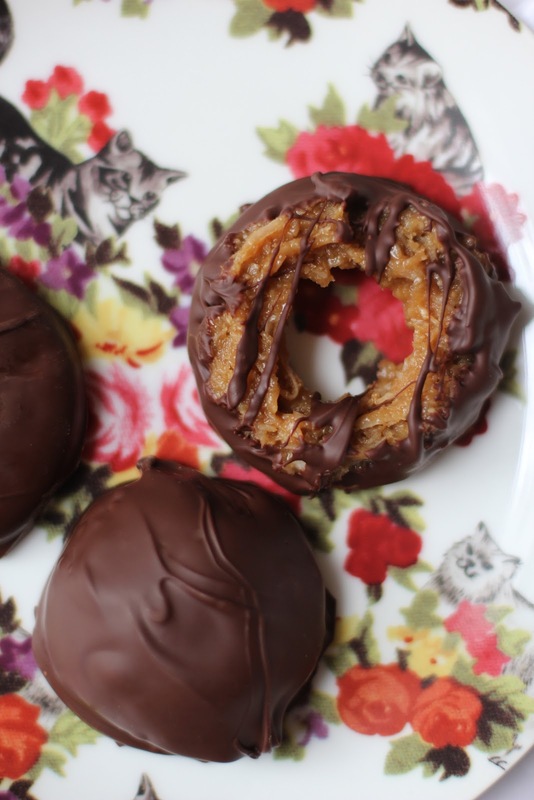 I will be pigging out Caramel D'Lite-style (Samoas for all you old-timers) this weekend!